Provide your team and organization with global oil & gas business training on your schedule. Thunderbird online Certificate in Global Oil & Gas Management is designed to provide your team with a well-rounded, global business understanding of the ever-changing oil and gas industry. This certificate will focus on Upstream, Midstream, and Downstream, and go into detail on financial management, product management, the refining process, transportation, and much more. If you are interested in sponsoring a group of individuals at your oil and gas company to participate in Thunderbird’s Online’s Certificate in Global Oil & Gas Management, please contact us, and we can further discuss the options that would be most beneficial to your organization. Through this online program, your team will have the opportunity to analyze and understand global oil and gas business strategies, and lead your organization to the next global level. Your team will immerse themselves in this Thunderbird Online oil & gas business training certificate, and gain a thorough understanding of today’s global energy marketplace, and how it directly relates to your organization. Learn more about the online Certificate in Global Oil & Gas Management. 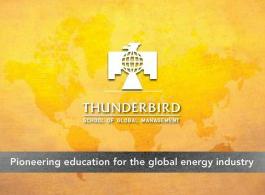 See the various companies who have participated in the Thunderbird classroom program, Advanced Management Program for Oil and Gas Industry Executives, at Thunderbird School of Global Management. Pre-assessment questions to test your knowledge of the provided book chapter(s). Interactive exercises and business case studies that actively engage you and reinforce content. Video presentations by Thunderbird faculty and subject matter experts. Real-world business challenges for you to experience and address global business issues. Post-assessment questions to test your knowledge of the topics covered in the module. Pluspetrol Exploration and Production S.A. Professor Andrew C. Inkpen, Ph.D., is a Professor of Management at Thunderbird School of Global Management. His research focuses on the management of multinational firms, knowledge and organizational learning, managerial issues in the oil and gas industry & strategic alliances and international joint ventures. He has worked closely with various industries focusing on the oil and gas industry. Dr. Inkpen has been the Academic Director on programs for organizations including ExxonMobil, CEMEX, Ericsson, Teleflex, Volvo Penta, DENSO and Cisco. "Doing business in difficult environments goes back to the beginnings of the commercial oil and gas industry. Oil and gas is one of those industries that was global way before everyone else became global, so in some sense the industry is like Thunderbird." - Andrew C. Inkpen, Ph.D. Professor Michael H. Moffett, Ph.D., is an Associate Professor of Finance and holds the Continental Grain Professorship in Finance at Thunderbird School of Global Management. He is also the Academic Director of the school’s innovative Thunderbird International Consortia and partnership programs among globally focused companies in Thunderbird Corporate Learning. Dr. Moffett’s areas of expertise include financial management issues unique to the global oil and gas industry, international finance and treasury management. “I can’t think of an industry that represents more what the Thunderbird challenge is all about. It’s a global industry. It’s got a unique history, and it’s integral to every human on Earth.” - Michael H. Moffett, Ph.D. Course Book: The Global Oil & Gas Industry: Management, Strategy, and Finance written by Professor Moffett and Professor Inkpen. Each participant receives 1.5 CEUs per online course completed, equating to 2.5 CEUs for the entire Certificate in Global Oil & Gas Management program.